Lawmakers in both parties could face a dangerous political dilemma after they return to Washington: Either endorse a second round of damaging sequester cuts or prepare for another government shutdown. The situation is that stark, and it’s coming on fast. 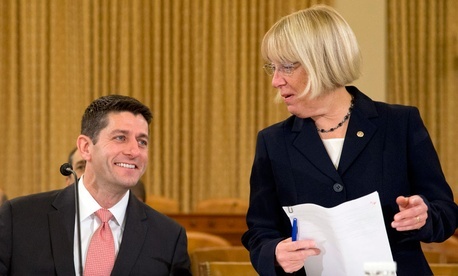 Budget negotiators led by House Budget Committee Chairman Paul Ryan and Senate Budget Committee Chairwoman Patty Murray are racing to beat a Dec. 13 deadline to draft a deal that would keep the government open beyond Jan. 15. They could get it done. Even House Speaker John Boehner says he’s hopeful. But other lawmakers and aides say the odds are not good, and that’s why House Republicans are now prepared to pass a short-term continuing resolution to fund the government at the $966 billion level that’s dictated by the Budget Control Act, ushering in round two of the hated sequester cuts. The GOP strategy carries significant downside, however. Republicans want the spending cuts, but this next phase of sequestration includes politically tricky reductions to Pentagon spending—a $20 billion slash that many lawmakers are desperate to stop. House Republicans, particularly, could find themselves in a lose-lose situation. They acknowledge the damage done by October’s shutdown saga and are determined to avoid a repeat in January, but many GOP lawmakers are afraid of cutting the Pentagon’s funding. Enough House Republicans represent military-heavy districts that any vote framed as supporting further sequestration could be unpredictable for GOP leadership. Boehner’s team can afford to lose only 16 Republican votes before needing help from the other side of the aisle. And given the sequester’s deep cuts to domestic programs, significant Democratic support for a continuing resolution that keeps the automatic reductions in place is unlikely. One vocal GOP opponent of sequestration, House Appropriations Committee Chairman Hal Rogers, has for months warned his colleagues against ushering in a second round of across-the-board cuts. Rogers speculated last week there could be some “sequester relief” included in a short-term CR, but he did not elaborate on how that would happen. Meanwhile, the Republican leadership, while open to replacing sequestration, has increasingly indicated that it will move forward with the cuts if Ryan and Murray cannot reach an agreement. Both Boehner and Senate Minority Leader Mitch McConnell have said that they will push their members to support the sequestration cuts, absent an agreement. As the Dec. 13 deadline approaches with no indication of a deal at hand, even some of the party’s most vocal opponents of sequestration have begun to soften their opposition. “I don’t like it, but I can live with it,” said one Senate Republican lawmaker, who has previously spoken out against the sequester cuts and asked not to be identified. Rep. Jack Kingston, R-Ga., a member of the Appropriations Committee and a vocal opponent of sequestration, said he couldn’t yet agree to a CR that would lock in those deep spending cuts, particularly to the Pentagon. But he, like many of his Republican colleagues, worries that budget negotiations will conclude on Dec. 13 without a deal. “I don’t know that they’re going to get anywhere,” he said. Kingston’s preference would be to get a budget agreement and pass 12 appropriations bills for the remainder of the fiscal year. But absent a deal, Kingston said he would be open to supporting a continuing resolution that locked in sequestration.